You know how everyone has that one friend that's always getting lost in a crowd? Oh, you don't? Maybe it's just us, or maybe you're the disappearing one in your group of friends! 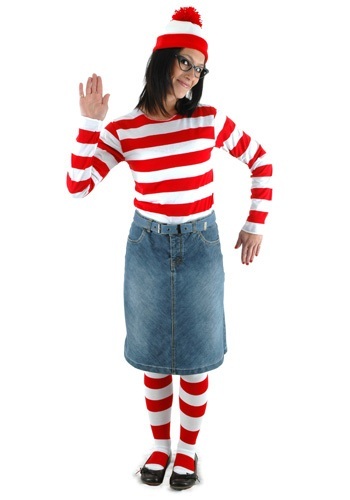 If you love traveling the world and hiding in big crowds while your friends search for you, then this Wenda Costume is the perfect look for you! In case you haven't heard of Wenda, she's Waldo's girlfriend, and we know you've heard of him before. Together in their matching red and white striped outfits, they travel the earth in search of huge crowds of people for Waldo to stand in. Why, you ask? So that Wenda can take his picture for their scrapbook, silly! As shown by her amazing pictures, Wenda is a pretty talented photographer, especially in the ones where there is a ton of action taking place and it's really tough to find Waldo, even though she has a habit of misplacing her camera in the process.